10 years ago today I started blogging! Just a little diary blog. I was turning over a new leaf after a few years of ups and downs which had included a bout of depression. I was settling down with the man I loved, I had just got some work though a job agency for the first time in a long time, which then led to the first job I ever loved! I was a different person back then. My life was all computer games, going to the pub, and office gossip (which I still love but have learned not to share on-line!) Amazing how much you can change in just 10 years! It took almost two years for me to share a photograph of my self! 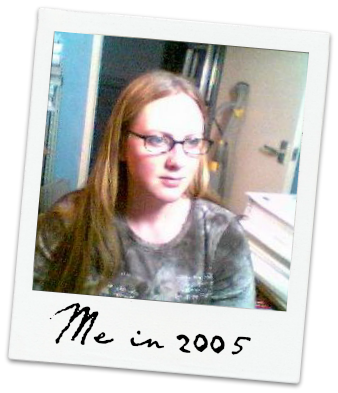 There I am, back in 2005. I'd lost the love for my job after some rather nasty office politics, and had started trying to run my own business (it didn't work out). I'm in my "home office" here, which is now Jack & Tom's bedroom! I love to go over my old posts every so often. Even just writing this today I stumbled across this little gem I'd forgotten all about: Who do YOU look like? I'm gutted that the little app doesn't seem to be on the site I linked to any more. But it made me laugh! And then there are the stories which have gone down as local legend, like I'd never been in a police van before, and the day Tom told me "Mummy, It's raining in the house!" Some of the greatest moments in my life are in this blog. Our wedding, the births of our three gorgeous sons Jack, Tom and George. 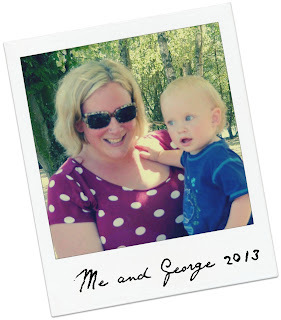 And I am hoping to announce a 4th bundle of joy some time soon (have you seen my 4th baby mini blog?) I've shared it all here. When I made my 1000th Post last month I asked people to ask me questions. The general theme that kept coming up was how have I kept it going for 10 years and where will I take it next? Keeping it going feels easy now, with the kids growing up and constantly giving me something to say, but it hasn't always been easy. There are huge gaps, of 6 months and more sometimes. But I've always come back to blogging. And now I have discovered link parties and reviews I have a whole new lease of life for my blog. That's mostly down to YOU! Without all you lovely people out there reading my blog and writing the blogs that I read I'd still be going no where. 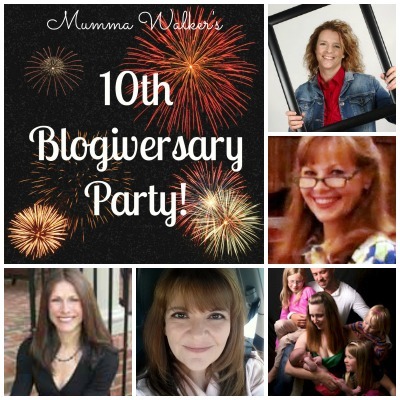 I've learned about blog parties from YOU! I've found places to apply for reviews through YOU! So now I'm trying to give something back by hosting my weekly Friendly Friday blog party, by Pinning and Tweeting as many of those posts as I can, and by sharing other peoples blog parties on Facebook. I'm not always great at replying to comments and for that I am sorry. We fight over the one PC in this house and often by the time I get chance to reply to comments a few days have gone by. But I do care, and I will reply or at least like a "like" or "+1" where I can. Anyway, that's enough about me. Now it's over to you! Here are the FEATURED BLOGGERS who won a spot on my (too long running, in hindsight) 1000th Post Party Giveaway. I do hope you'll check out their blogs, follow them, and leave a comment - as always - if you would like them to follow you in return. So many blogs to choose from. So little time. At ritewhileucan you will find inspiration, new ideas, and thought provoking discussion. I am a passionate advocate of the lost art of letter writing AND making the most of every moment —rite now! My hope is that this blog will fuel the desire for you to connect with people in your life in a very personal way – through letter writing. And that while connecting to those around you, you will seize every moment that we have been given (the good and the bad) and learn and grow. After a career as a newspaper reporter and editor, Melissa Swedoski thought she was well informed on the chaos of everyday life. Then she married a man 13 years her junior and became a SAHM to two toddler girls. Now, she’s mumbling through the mayhem of marriage and motherhood in a small Texas town, turning her investigative eye on the mishaps and misadventures of parenting and the marathon that is marriage, always with the emphasis on humor and love. 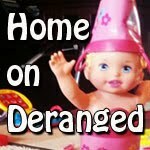 You can find her living her big little life at Home on Deranged. 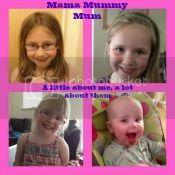 Hi my name is Chantelle, I thought I would share with you my story of how I came to be MamaMummyMum I am a SAHM to 4 beautiful girls and wife to a hard working husband. I decided to write this blog to help me remember all the moments I share with my little family. "Not Your Ordinary Psychic Mom"
Melissa is a mom entrepreneur, multi-faceted business woman, and creative producer, authoring and illustrating seven children's books and three self-help books. She has written articles (Color and Its Affect), been interviewed on television (discussing How to Raise Creative Children), spoken in front of hundreds of people (Southern Women’s Show), and successfully achieved two degrees undergraduate degree in finance and graduate degree in marketing). No rules... Go for it!